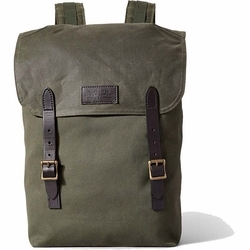 Filson Ranger Backpack. Inspired by a vintage forestry pack, this Rugged Twill backpack features a cotton-lined interior, removable wool zipper pouch and interior divider for organization of stowed gear. A top expansion panel with drawcord closure allows varying levels of fullness when packed, while a storm flap with Bridle Leather buckle closure will keep your gear protected from rain and dirt. The padded shoulder straps have webbing daisy chains, and a padded back offers comfort even when carrying it all day long.